The Wildhorse Canyon trail is located in the San Rafael Swell between Green River and Hanksville, Utah. The trail is one of only a handful that allow passage between the east and west sides of the swell. 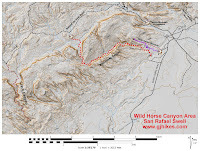 Unlike Crack Canyon and Ding and Dang Canyons, Wildhorse doesn't require any technical skills to navigate. There is one section of narrows near the east end of the canyon but unlike Little Wildhorse and Bell Canyons the walls are much shorter. 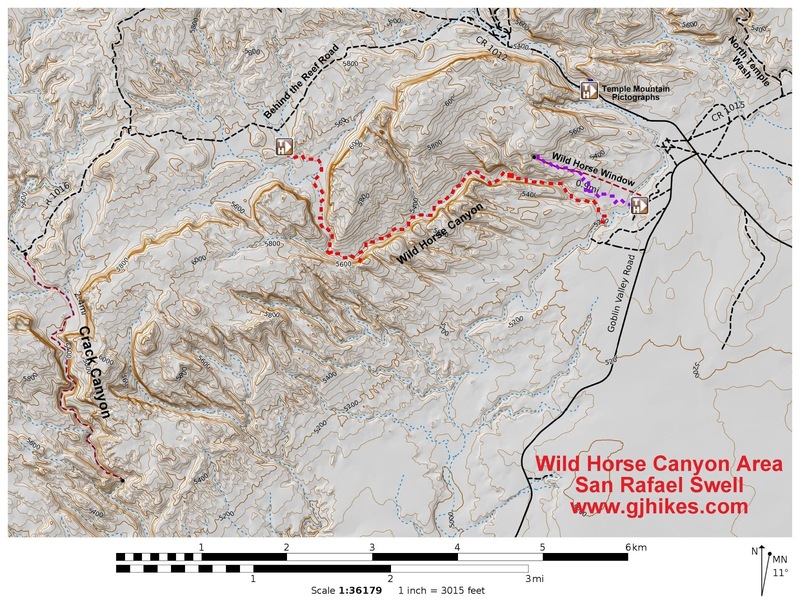 The Wildhorse Canyon trailhead is located off of the Behind the Rocks, a.k.a. Chute Canyon Road on the western side of the swell. Google does a good job with the directions to the trailhead but in general take Exit 149 on Interstate 70 and drive south on Highway 24 for 24 miles. Turn west at the Goblin Valley sign and follow the Temple Mountain Road through the reef. The Goblin Valley Road branches off to the left just before the Swell and the pavement ends about 3/4 of a mile later. At 7.3 miles from turning off of Highway 24 turn left on the obvious but unmarked road heading south just past the staging area that you pass on the right side of the road. It is about 1.6 miles to the turnoff to Wildhorse Canyon. The road is a little rough in places but in general even passenger cars can manage the road. The first part of the trail is open to vehicles for almost 1 mile. There are several nice primitive camping spots up to this spot as well as quite a few around the trailhead. Most of the canyon has a sandy bottom. The sand isn't too deep but it does add to the effort it takes to hike the canyon. Look up at the point where the canyon makes a sharp turn to the left and you will see the Wildhorse Natural Bridge. A little lower and to the right and you can also see Clasp Arch. There are a couple of narrow slots that are easy enough to hike around. The first one can be bypassed on the left. The GPS track for this hike has a couple of weird points plotted on it that came about when the high walls of the canyon were blocking its access to enough satellites to get an accurate reading. On a hot summers day those same high walls should provide a little relief from the sun. The second slot can be bypassed on the right. 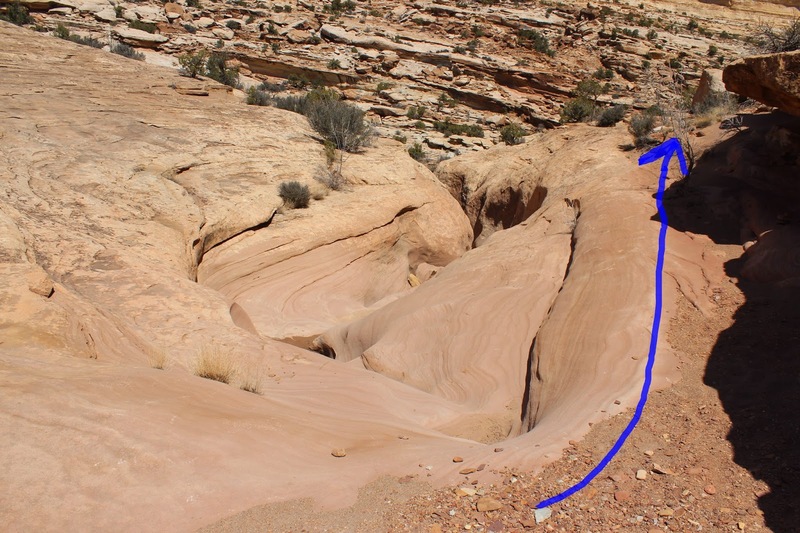 It is tempting to drop into the slot because it looks like it would be fun to hike through. A large rock jam part way through the slot creates a massive spillover that would be much harder it get past causing you to get trapped inside of the slot or at least having a most difficult time extricating yourself. Near the lower end of the canyon, about 3.25 miles from the trailhead, there are some petroglyphs on the right, or south side, of the wash.
Just before reaching the mouth of the canyon the trail passes through a fun set of narrows. The mouth of the canyon spills out into the wash between the reef and the Goblin Valley Road. For those not wanting to drive around to the Wildhorse Canyon trailhead behind the reef there is the option of beginning at this end. There aren't any trail signs or any other way of identifying which canyon to hike up except maybe the big cottonwood tree in this picture. On the way back up the canyon we noticed a petroglyph of concentric circles beneath an overhang that may have been used at one time to mark the summer solstice. We are guessing the summer solstice because that is the only time the sun would be high enough to have any effect on the petroglyph. Wildhorse Canyon is an enjoyable hike. The natural bridge and arch, with the petroglyphs and little set of narrows make the exploration of the canyon a grand adventure. With numerous rock art sites, adventurous slot canyons, and over 80 arches and natural bridges the San Rafael Swell can take a long time to explore. Wildhorse Canyon is one of the Swells funner places to visit. If you would like to see it for yourself then all you have to do is 'Take a hike'.